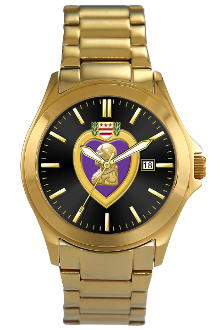 Our NEW Gold Purple Heart Watch. We were able to work with the Factory and get a GREAT DEAL. These watches normally retail for $149.95 Plain, No Purple Heart, but we were able to get them with the Purple Heart for almost half the cost. Since We saved money, You save money. On Sale at ONLY $79.95 saving you $70.00 These are one of the best quality watches we have ever had.